I have nobody to blame but myself for seeing Crazy Rich Asians. When I first saw the trailer, I made a joke to my editor about how I’d probably be the one ReviewSTL asked to review it since I am, in fact, Asian. Didn’t think anything of it. Surely they’ll find someone to cover it. Released in 2013, Kevin Kwan’s eponymous novel became a best-seller and cultural sensation. The concept of a dramedy set in an ultra-rich Asian society proved so popular the movie rights were optioned and Kwan followed it up with two more novels featuring the same characters. The setup for the film is pretty straightforward. Rachel Chu (Constance Wu) is a professor of economics at NYU who’s been dating her boyfriend, Nick Young (Henry Golding), for over a year. Raised by a single mother (Tan Kheng Hua) who worked ceaselessly to provide for her, she lives rather frugally; since Nick is also a professor at NYU, she presumes that he’s also from a relatively modest background. Obviously, this isn’t the case, as she discovers when she goes to Singapore with him during their spring break to attend the wedding of Nick’s best friend. Turns out his family is among the wealthiest in the world, a fact that he’d managed to hide for over a year. Sidenote: this is perhaps the biggest plothole possible. Perhaps it’s explained in the novel, but I find it pretty incomprehensible that she would have no way of knowing that Nick’s family is among the wealthiest in the world, their fortune presumably worth tens of billions of dollars. With the internet readily available at her fingertips, the fact that she’s a professor of economics, and the attention that Nick seems to receive in public (in an early scene, one gawker snaps pictures of the two together and quickly promulgates it), I cannot fathom that she wouldn’t have found out in the course of their dating for over a year. The rest of the movie, and I say this without a hint of hyperbole, is an amalgam of every generic romantic comedy you’ve seen the last twenty years. You have the standard “mother (Michelle Yeoh) doesn’t approve of her son’s girlfriend” story, the beautiful ex-girlfriend (Jing Lusi) who incites jealousy, the comic relief best friend (Awkwafina) who pulls one-liners the entire movie, the revelation of an affair subplot, a silly clothing montage as Rachel tries on dresses for the wedding, and so on. There’s little in the way of suspense or plot twists; most of what happens can be predicted relatively early on. What saves this movie, though, is that despite the relatively tired formula, well…it works. 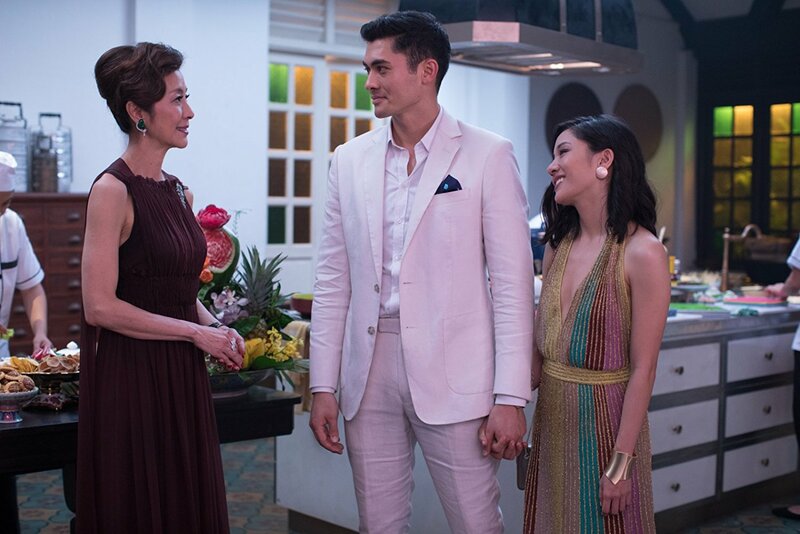 The interactions between characters are incredibly organic; when Nick and Rachel land in Singapore and spend the evening with the future bride, Araminta (Sonoya Mizuna), and groom, Colin (Chris Pang), we don’t get the impression that they’re just actors playing out a script. I truly felt like I was out with friends grabbing dinner and drinks. Based on the trailer, I thought I was going to intensely dislike Awkwafina’s character, but she plays it well; she’s a bit annoying at times, but she’s genuinely hilarious and delivers her one-liners expertly. There really wasn’t a weak performance among the cast; the story is pure vanilla, but it’s a superlative flavor. Humor is rampant throughout the movie, even in some of its most tender moments, and at times the audience was in stitches. The other true strength of the film lies in its visuals. 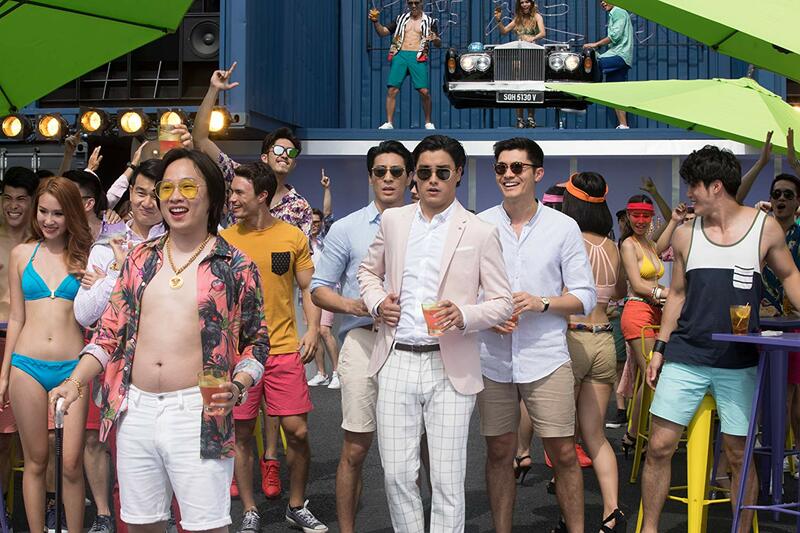 Seeing as the bulk of the characters in the movie are absurdly wealthy, we expect a lavish film through and through, and Crazy Rich Asians delivers. From the palatial mansion the Young family lives in, to the bachelor and bachelorette parties, we’re given a glimpse of the lifestyles the one percent of the one percent live, and it’s jaw-dropping. 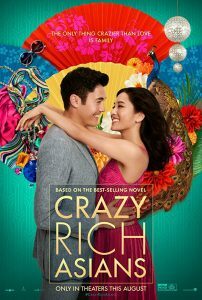 The overall tone of the movie is pretty light-hearted, but it does touch on some relevant modern topics, notably the gap in the disparity of wealth between the working class and the absurdly rich. There is an increasingly present amount of classism throughout the movie; in one scene, one of Nick’s family members cannot comprehend that Rachel is not from a wealthy family. The interaction and tension between Rachel and Eleanor (Nick’s mother) revolve around Rachel’s upbringing and the cultural differences in how families are cultivated. The film doesn’t delve too deeply into the topics, but it does give some food for thought. 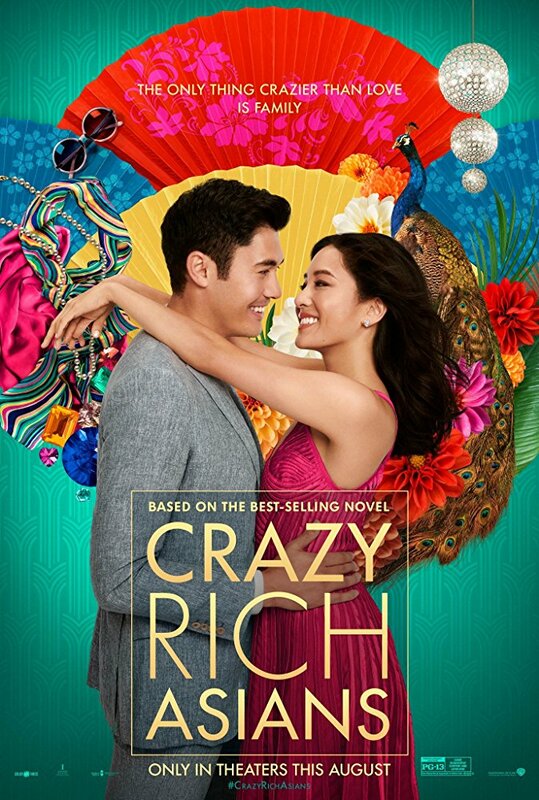 Bottom line, if you’re intrigued by the idea of seeing the lifestyles of the insanely wealthy or you simply like a well-done romantic comedy, you could do worse than Crazy Rich Asians. I personally subtract some points for the overly generic storyline, right down to the very end, but I also acknowledge that some of my favorite movies are mindless action films with generic storylines. If you’re okay with this, add a full letter grade on to my rating and head to the theater.